We spent many hours of research to write this American Consumer Opinion review. In order to get a complete understanding of this survey site, we looked at review websites such as SiteJabber, TrustPilot, SurveyPolice, and the Better Business Bureau. We also joined American Consumer Opinion to get an insiders view. Consumer participation panels are popular and make a fun way to earn prizes or money. In this American Consumer Opinion review, we’ll tell you what you need to know about this company. 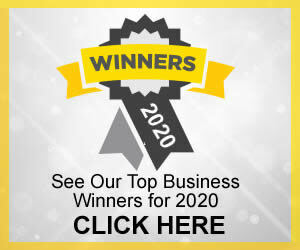 The goal of this American Consumer Opinion review is to help you decide whether this might be a good opportunity for you to make some side income. American Consumer Opinion (ACO) is an online consumer review forum. It is made up of ordinary consumers who provide their opinions on various products and brands. They provide those opinions by filling out surveys. Members earn rewards for completing surveys. ACO started in 1986. Of course, there was no Internet then. It began as a mail survey panel. Members of ACO received surveys by mail. Completed surveys were mailed back to the company. What hasn’t changed is that panel members back then earned rewards, just like today. The Internet age made it much easier to reach out to consumers on a broad scale. It went online in 1996. Prior to 1996, the panel was only open to US residents. When it went online, it was opened up to consumers in all countries. Today there are panel members from every country in the world. ACO is owned by Decision Analyst, Inc (https://www.decisionanalyst.com/). It was founded in 1978. Decision Analyst is a global marketing and research company. It is based in Dallas/Fort Worth, Texas. ACO is open to anyone aged 14 and older. It is free to join. To join, you must go to https://www.acop.com/ and sign up. The sign up process is simple. You’ll need to provide your name and choose a password. Once you have done this, you’ll be asked to provide basic biographical information. This includes your full name, address, level of education and living situation (i.e. marital status, whether you own or rent your residence). When you have completed this, you’ll have access to your dashboard. Your dashboard contains important info like how many points you have accumulated, any draws you’ve been entered in (more on draws later) and surveys that you are eligible to fill out. There’s also a log that shows how many and which surveys you’ve already completed. You will also be invited to complete the “new members” survey. This survey contains questions related to your living situation, such as how many people live in your household, whether your household members are male or female, ages of household members, etc. Companies that partner with ACO always have a “target market.” This refers to the kinds of people they are looking for opinions from (a “demographic”). Not every company will be interested in opinions of all types of people. For example, a makeup retailer will only be interested in the opinions of females who wear makeup. A toy company will only want opinions from people with children or from teenaged panel members. A grocery chain will only want opinions of adults who are the primary grocery shoppers in their household. For this reason, individual members will not be “eligible” to complete every survey ACO administers. Instead, ACO sends direct invitations to panel members to complete surveys based on the members’ profiles. The “new members” survey helps ACO decide who to send which surveys to. For example, invitations for a survey about a toy brand will be sent out to members who indicated they have young children. A screener is a short survey (shorter than regular surveys). Screeners are worth between five and fifty points. Alternatively, some screeners may not be worth points. Instead, your reward is an entry into ACO’s monthly draw. Draw winners are awarded gift cards. Invitations to complete surveys and screeners are sent to you via your email address. They will also appear on your dashboard/account page. You’ll also notice a sidebar on your dashboard page that says “polls.” Polls are usually a single question, and they may be about any consumer topic, like your favorite kind of pie, what kind of car you drive, what brand of toothpaste you use, etc. Polls are not worth points. They’re just a fun little way for ACO to gather information from panel members. Members may also qualify to participate in new product “panels” or trials. They may be asked to sample a product. They must then answer questions about their experience. These panels are also worth points. You will be told beforehand how many points they are worth. Every survey is worth a specific number of points. Each “point” is worth one cent. As we already mentioned, screeners are worth five to fifty points, or one draw entry. They typically take only a few minutes to ten minutes to complete. Regular surveys are worth more because they take longer to complete. They range from 50 to 1000 points. Generally, the longer the survey, the more points it is worth. According to ACO, the average length of time that it takes to complete a survey is ten minutes. You must accumulate a minimum of 1000 points to “cash out.” (You can up more than 1000 points if you wish.) Once you have reached the minimum, you can trade your points for cash. 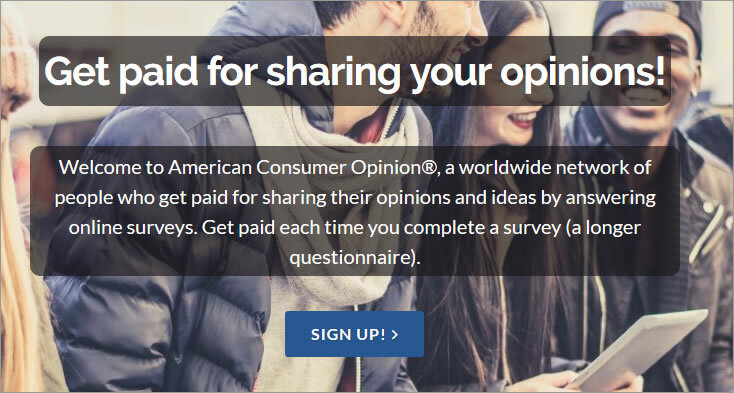 How Much Money Can be Made with American Consumer Opinion? As we already noted, there is no guarantee of how many surveys you’ll be invited to complete. Therefore, it is difficult to say how much money a person can earn as a panel member. ACO does state that “most members receive several survey invitations per year.” If you were to complete twelve surveys in a year (an average of one per month) at 500 points each, you would earn a total of $60.00 in rewards for the year. However, this does not seem to be the typical experience of many users. Many average between 1000 and 2000 points annually. As we already stated, you can exchange your points for cash when you reach a minimum of 1000 points (worth $10). To cash in, you must click on the “cash out” link on your account page. You have two major options for receiving your pay. 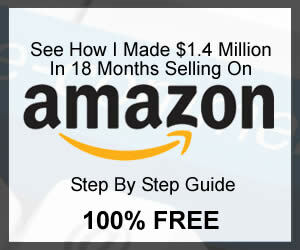 The most popular method is through PayPal. When you choose PayPal, you receive your funds within 8-12 weeks, according to ACO. You can also choose the “Hyperwallet” option. Hyperwallet works similarly to PayPal. However, it will take about 8-12 weeks to get your money this way. 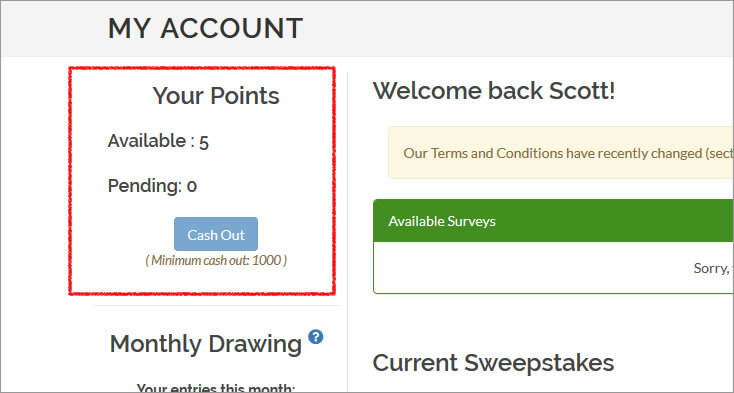 There are two other options for cashing out your points. You can actually donate your reward to charity. There are several major charities partnered with ACO. You’ll see a menu of all of its charities. All you have to do is click the one you want to donate to. 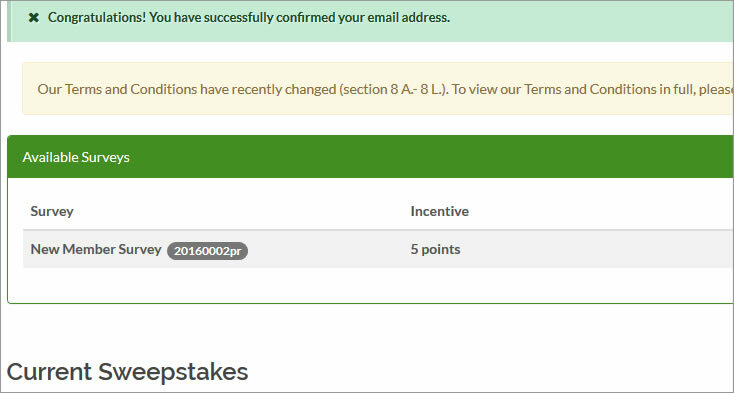 You can also trade your points for sweepstakes entries. There is one sweepstakes draw per month. Remember how we said that invitations are extended based on your demographic (your biographic info, consumer habits, etc)? The more information you provide to ACO, the more likely you are to receive survey invitations. Therefore, it is crucial that you fill out the “new members” survey right away. We also advise you to fill out those monthly screeners. The screeners are ACO’s way of continuing to gather information about your consumer habits. Filling out all screeners increases the likelihood you’ll be asked to complete the longer (and more lucrative) surveys. In order to enhance our American Consumer Opinion review and help you decide if ACO is worth your time, we checked out what other ACO users have said. We started out with American Consumer Opinion review posts on SurveyPolice.com. Survey Police is a consumer review site that specializes in survey company reviews. At the time of writing our American Consumer Opinion review, there were 266 American Consumer Opinion review posts on Survey Police. ACO had an overall ranking of 1 ½ stars out of five. Reviewers seemed generally happy with the content of ACO’s surveys. Some reviewers felt that the did not receive an adequate number of survey invitations or qualified for too few. Others were satisfied with the number of invitations and qualifications. By far, the most common complaint was speed of payment. Many complained that it took longer than promised to receive their payment after cashing in their points. A significant number of reviewers stated that it took three months or more to receive PayPal payments. Check payment took even longer. We also found American Consumer Opinion review posts on Sitejabber.com. Here, there were only nine reviews posted. ACO had an overall ranking of 1 ½ stars out of a possible five. One American Consumer Opinion review post had mainly positive comments. This reviewer felt that the site provided good customer support and adequate incentives. The other eight reviews had the same common theme. All eight felt that it took too long for ACO to process their payments. Processing times averaged between three and six months for both PayPal and check payments. We also checked with the Better Business Bureau. Here, ACO is listed under the name of its parent company, Decision Analyst. Under “Decision Analyst”, ACO had a total of 144 complaints. A read-through of the American Consumer Opinion review posts indicated that the vast majority of “billing and payments issues” complaints were about late or missing payments. Those complaining of “problems with product/service” also had common themes. Some were about having their accounts terminated suddenly and without explanation from ACO. Some of those whose accounts had been terminated suddenly were on the threshold of the cashout minimum. Others weren’t sure why they were terminated and couldn’t get a response from ACO’s customer service department. Some users were able to get their accounts restored. Some were able to get the payment they were due to receive after contacting ACO. For this American Consumer Opinion review, we signed up for an account of our own. The profile we created was for a female aged 47, married with three children. Initial sign-up took less than a minute. After receiving a confirmation link via email, we were directed to fill out a basic profile, which took only a few minutes. We were immediately invited to complete a “screener survey.” It was indicated that this survey would take about 5 minutes. The survey asked for more detailed biographical information. This included occupation, employment status, level of education, and number, names and ages of household members. The survey was administered one or two questions in a single screen at a time. A bar at the bottom of the screen indicated by percent how much of the survey we had completed to that point. We were pleasantly surprised that we were able to finish the entire survey in under three minutes. However, this time length may vary for others, depending on their unique answers. We were immediately rewarded with five points for completing the survey. Once we finished, we checked our profile page to see if we were eligible to complete any other surveys. We did not, nor did we qualify for any new ones over the next four days. Since the account was very new at the time of writing this, we can’t comment on anything regarding payment. Since the minimum number of points required for cash-in is 1000, it would likely take us a long time to reach that at this rate. To check on response times, we emailed the support department to ask several basic questions. It took close to 4 days to receive an answer so this is just too long. When we initially researched ACO, we liked what we saw. The website wasn’t flashy, but it was professional-looking and easy to navigate. SIMPLE SIGN-UP: The sign-up process was simple, straightforward and not time-consuming. The invite to the screener survey was immediate. GAVE POINTS FAST: The screener took less time than it said it would to complete. We got our five points right away. Although we didn’t get any other survey invitations within a few days, we don’t feel this is a strike against ACO. They are clear and up-front that survey invitations may be sporadic. They also say most users get at least one invite per month. Had we not done any outside research on ACO, we may have readily recommended ACO as a good side-income opportunity. However, when we checked reviews by other (present and former) ACO users, we felt we couldn’t ignore the overwhelming common thread: ACO takes a long time to process payments. LONG TIME TO PROCESS PAYMENTS: Although American Consumer Opinion says that PayPal payments take 8 to 12 weeks, many users waited much longer. Most reviewers did eventually get paid, just not within the 8 to 12 week time frame. Despite the inordinate amount of time users waited for payment, other types of complaints were fewer. ACCOUNTS BEING TERMINATED: We read a few complaints of accounts being randomly and suddenly terminated. There were also a few regarding trouble with customer service. These complaints ranged from emails not being answered, to being given misleading information about payments or accounts to not getting enough survey invitations. There were also many positive American Consumer Opinion review posts online. Reviewers seemed to like the content of the surveys. They also reported that surveys were easy to understand. Finally, many reviewers mentioned that the estimated time for completion of surveys given by ACO was accurate. Taking all of this into consideration, plus our experience, we don’t want to discount ACO entirely. 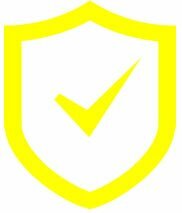 We believe that the potential to earn a little bit of side cash is authentic. Just don’t rely on it as a steady or predictable source of income. Also, don’t expect to get rich. However, because there is clearly an issue with speed of payment, we urge some caution. We feel it is safe to take part in ACO, as long as you don’t mind waiting two to six months to get paid after cashing in.